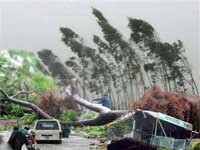 The death toll from the worst storm to hit Vietnam so far this year has risen to 17, disaster officials said Tuesday. Twelve others were reported missing. In the Central Highlands province of Daklak, three more bodies were recovered Monday, bringing the death toll there to seven, with 12 others still missing, said provincial official Phan Thi Thu Hien. In Ha Tinh province, lightning killed three farmers Monday, while heavy rain continued to cause floods, said another official, Dao Con Bach. In Lam Dong province, four people were washed away by flash floods and confirmed dead, while a 13-year-old boy was killed by a falling tree. There were victims also in Phu Yen and Gia Lai provinces, officials there said. Hien said there was no damage to the coffee plantations in Daklak province, Vietnam's main coffee growing area. The tropical storm, which dropped more than 60 centimeters (24 inches) of water on Vietnam's central region over the past few days, was downgraded to a depression Monday, the national weather center said. Heavy rains were reported in some north-central provinces Tuesday and the weather center warned of flash floods and landslides.